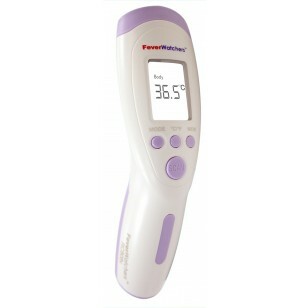 Designed with doctors and parents in mind, the FeverWatchers non-contact infrared (IR) clinical thermometer provides a simple, expedient, and accurate way for initial fever screenings by taking the surface temperature of areas on the face such as the forehead or tear ducts (at the corners of the eyes). Powered by advanced non-invasive infrared technology, FeverWatchers™ digital IR thermometer obtains the body temperature reading with 0.3 Celsius degree (0.2°C within 36°C - 39°C Range) accuracy in less than 1 second through a simple click. It features an intuitive guidance system to secure positioning and confirm accurate readings. Temperatures (Fahrenheit or Celsius) are displayed on a huge back-lit LCD screen for easier reading even in total darkness. Adjustable audio alarm will alert you if the temperature is too high (beyond the preset threshold). Since there is no contamination risk for this non-contact IR medical thermometer, one can immediately start again to scan the temperature of other family members or individuals without having to disinfect or change the tip. 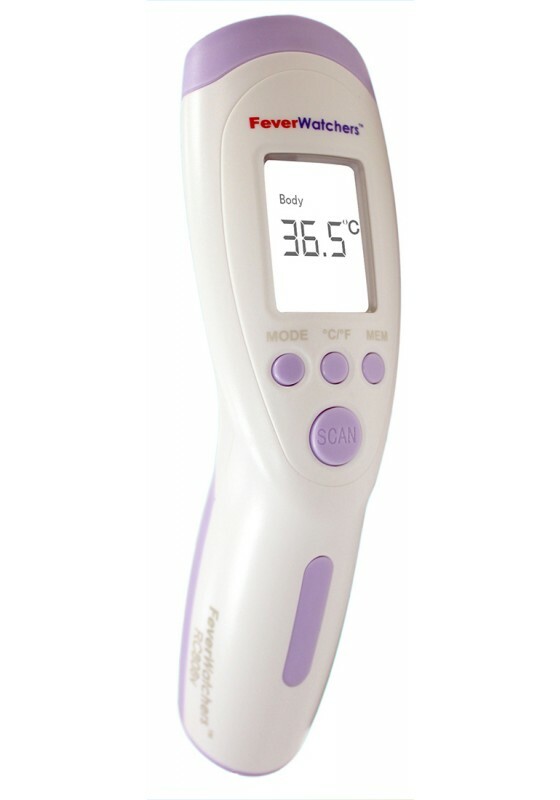 Designed with doctors and parents in mind, the FeverWatchers™ non-contact infrared (IR) clinical thermometer provides a simple, expedient, and accurate way for initial fever screenings by taking the surface temperature of areas on the face such as the forehead or tear ducts (at the corners of the eyes). Powered by advanced non-invasive infrared technology, FeverWatchers™ digital IR thermometer obtains the body temperature reading with 0.3 Celsius degree (0.2°C within 36°C - 39°C Range) accuracy in less than 1 second through a simple click. It features an intuitive guidance system to secure positioning and confirm accurate readings. Temperatures (Fahrenheit or Celsius) are displayed on a huge back-lit LCD screen for easier reading even in total darkness. Adjustable audio alarm will alert you if the temperature is too high (beyond the preset threshold). Since there is no contamination risk for this non-contact IR medical thermometer, one can immediately start again to scan the temperature of other family members or individuals without having to disinfect or change the tip. FeverWatchers™ was designed specifically for forehead temperature detection from a 1"-4" (5-15cm) distance with an 89°F-109°F (32.0°C-43.0°C) temperature range. Unlike other IR thermometers that only measure surface temperature, FeverWatch™ is clinically calibrated to convert the forehead temperature reading(external surface) into internal body temperature which is one of the most important vital signs for human being. It can also store 32 temperature readings for future reference. For families using FeverWatchers™, there is no need to place the thermometer in contact with any part of your or your baby(s') body. The bright back-lit LCD screen displays readings even in total darkness. A sleeping baby or patient will not be disturbed by the FeverWatchers™ as it is is used nor will it cause any discomfort if they are awake. For public health authorities, it provides a simple, quick, Non-contact, and non-invasive way to perform preliminary mass-screening for H1N1 fever (swine flu) infection symptoms (body temperatures above 98.6 degrees Fahrenheit or 37 degrees Celsius). FeverWatchers™ can take over 100,000 readings on a single set of 2 AA batteries (included). With its rugged, impact and water resistant design, FeverWatchers™ is able to take over 3,000,000 measurements in the product's lifetime. The FeverWatchers™ Professional infrared digital thermometer has obtained FDA and CE approval for use in medical facilities as well as home health care. Accuracy, water-resistant design, guidance system, adjustable alarm, readings memory, and back-lit LCD digital readout are all standard features in this powerful Infrared medical thermometer. On top of that, this FeverWatchers Talking thermometer offers English and Spanish readings in voice. You will hear the result without having to look at the display screen. Specially designed to take the body temperature regardless of the room temperature. Safe for expectant mothers, infants, adults, elderly, patients, and the disabled.